GERMAN booze firms are gearing up for a showdown with Scottish whisky makers as they bid to become the world’s number one producers of Scotch. Whisky lovers have praised German attempts to recreate single malt whisky, but it is set to create a major row with Scottish producers. Master distiller Cornelia Bohn makes her malt, called Prussian whisky, in Schonermark, Brandenburg. Bohn belongs to a group of around 40 malt-whisky makers in Germany – the most prominent of which are the Slyrs distillery in Bavaria and the Spreewald Brewery in Brandenburg. The Sloupisti single malt from the Spreewald Brewery was awarded top marks by UK whisky critic Jim Murray. He included it in the “superstar whiskies that give us all a reason to live” section of the 2010 edition of his Whisky Bible. The Germans hope to beat Japan into second place in whisky making within a decade, then move on to toppling Scotland. Just 100,000 bottles of malt were produced in Germany in 2010 – nothing compared with the output in Scotland. 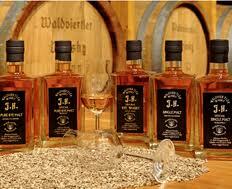 But it is just the beginning, say the German distillers. In Austria, distillers are also attempting to steal Scotland’s whisky crown. The Waldviertler Roggenhof distillery and Whisky Experience World in Austria last year attracted 75,000 visitors – more than the Glenfiddich Distillery.